Reformation is “both” king and priest. Jesus is our example. He is our priest, but He is also the King of kings. Jesus is our only savior, but He is not the only son. He’s the firstborn among many brothers and sisters. God is in the business of bringing many sons to glory now, not just in heaven (Heb 2:10). Understanding our functions as priest and king is how we get to that level of glory. 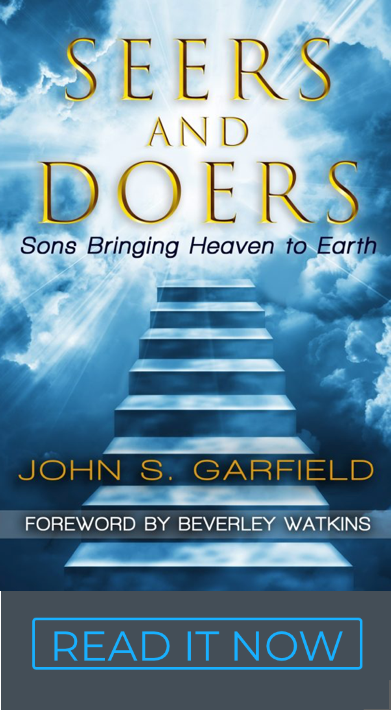 The open door – Son-kings have this relational access to the Father in heaven. As kings, we make wise decisions, lead from the heart, prepare deliverables, create value, meet schedules, and manage cash flow. We are being invited to connect the dots between our business and the Kingdom. We are no longer just doing business or even kingdom business. Our highest mandate is discipling nations (Mt 18:19). We are not sending missionaries, we are His ambassadors. 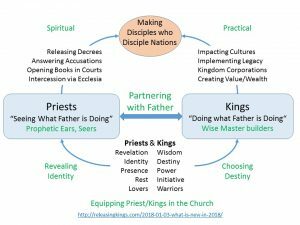 As priests, we are part of an ecclesia targeting intentional reformation to disciple nations. We intercede, open books of destiny, and answer the accuser in the courts so that decrees are released to trumpet the next advance of the Kingdom. We are conducting business or warfare in heaven first and then working out the manifestation on earth second. 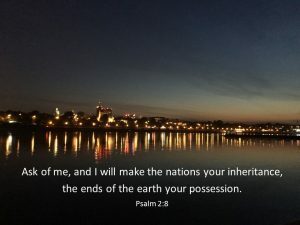 Your and my businesses are part of God’s Kingdom strategy to bless and disciple nations. Translation – Here is one example from my own life. Before a big event, I sometimes get a picture or dream about how it will go. I imagine it in advance. I think of what I might say or do and what results will come about. I used to worry that is was a bit carnal that I didn’t trust God or my prophetic gift enough to be extemporaneous. Then I worried that perhaps it was manipulative or new age witchcraft. I’ve finally realized it is normal for sons to intentionally go to heaven in prayer and see what their Father is doing and then do the same on earth. Now I’m a conscientious steward of my access into God’s presence. Before every big event, or meeting or year (2018), I’m going to heaven first in prayer to secure the outcome. I’m trying to see it in advance and even contend for the right outcome in advance. I’m releasing resources, relationships and results in the spirit as a priest so that the Kingdom comes first back here on earth. I’m seated with Him in heavenly places for a reason – to conduct business in my priestly role. In fact, intercession and access to the courts of heaven are a practical part of my business plan to carry out my kingly function. Prophecy, the seer gifting, and apostolic authority are not just for 5-fold ministers, they are for everyone – every son and daughter! They are normal equipment for kings that we use all the time. They are demonstrated in churches and conferences, but the real use is for you and I in our mountain. Moving mountains starts with prayer – going to heaven to get what’s in your book. Then it’s just a matter of “working” to implement the solution or speaking to the issue. Warfare – Notice that while we’re praying, “accusations” may come up regarding my worthiness or the viability of my and God’s plan. When they do, I’m simply asking forgiveness or extending forgiveness so that Jesus’ redemptive work on the cross covers every open door and removes any access the accuser may have to disrupt my “mountain moving.” I’m not resisting accusations, I’m repenting for the open door that allows them to be present. It’s like Judo – I’m agreeing with my adversary to make room for Jesus to deliver the counterpunch with His blood (normal business practice via Mt 5:25 and standard Courts of Heaven stuff). I stopped fighting with demons on earth. It all gets settled in heaven ahead of time. A touch or a word is all it takes, if our homework in heaven is done first. The greater things available to us are not just making disciples, but making disciples of all nations (Intentional reformation). It’s already in your book and can be seen now in a theatre near you (heaven). We’ve been thinking and asking way too small!